Sometimes “no” does not really mean “no,” but you have to be alert to see when this applies. 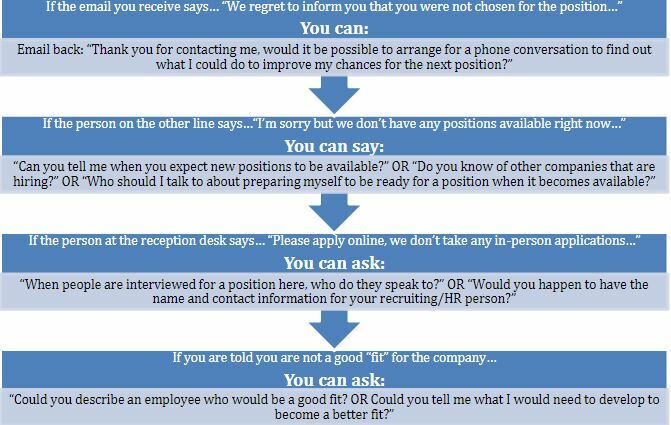 The more executive the position you are seeking, the more likely you are to be “tested” with “semi-rejections” to see how you respond and what your next step will be. Generally speaking, if your efforts result in people continuing to reply to you, it is because they are interested. Use this interest by getting more information, a referral, or a letter that thanks them for their efforts and (discreetly) points out a few more of your strengths for the position. You usually get three tests to see how determined you are to meet the criteria and be a part of the team. The “3 tests principle” can be found in business and community negotiations around the word. In Afghanistan it is called “3 cups of tea”. In Ireland they say “3 times the charm” and “third time lucky.” It consists of being attentive and persistent without pestering the other person, which can be equally off-putting. Try to develop a thick skin and detach the job rejection from your own sense of competence. You are competent and someone out there is looking for you. Try to turn every “no” into a “maybe” or a “referral” and with a little patience you will still reach your goal. We want to hear about your job struggles and success stories so we can fine tune our content to what our readers NEED TO HEAR: email info@shiftworkplace.com. Check out our Course Catalogue for online and blended courses that can help you learn how to find the work you’ve been looking for.